Mooroolbark Christian Fellowship (MCF) in the eastern suburbs of Melbourne, Australia, began to reach out into its community about seven years ago as God provided us with both desire and opportunity. In the beginning we were provided with small practical opportunities. One was to invite people to join us for occasional interesting day trips by bus. 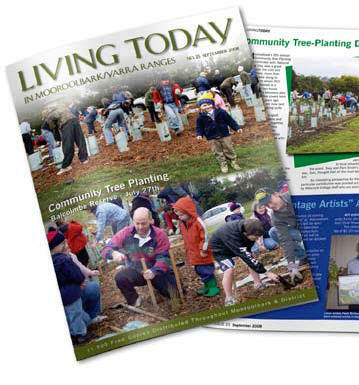 Another was to share our denomination’s national magazine, Living Today. Our congregation distributed several thousand copies around our community, including advertising about upcoming events we were hosting. In 2001, financial limitations forced the closure of Living Today just when MCF was beginning to be recognised as “the people who send us that magazine” and we had begun to receive responses to inserted advertising about the bus trips. So we wondered what God might provide to help us maintain the momentum. After prayer and congregational dialogue, we decided to nurture these emerging responses by publishing our own community-focused magazine. We started with one or two folded letter-size flyers delivered by hand to local households. 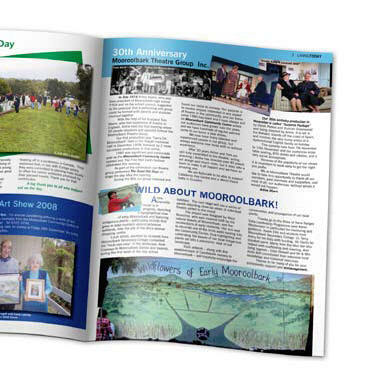 Then we took what seemed like a huge step forward by publishing the first four-page edition of what we decided to call Living Today in Mooroolbark. Today, we distribute more than 11,000 copies of this full-color magazine each quarter. A member of our pastoral team serves as editor, and he leads a small team of writers and photographers within the congregation. Another member owns a publishing business and was able to give us favorable printing rates. Highlighting the many positives within our community. Encouraging partnership in community initiatives. Contributing to the process of identifying and addressing community needs and concerns. Our editor and writers plan each edition taking into account feedback and ideas from the community. Each issue contains positive news, stories about local history and personalities, and articles about local government, businesses and community groups. Each edition also singles out a community or family issue and presents it in a way helpful to our readers. We also include a brief article on the same subject from a Christian perspective that might appeal to a secular readership. Sometimes we adapt articles from Christian Odyssey, and in recent issues we’ve offered a free copy of Christian Odyssey to interested readers. Focus on being a gift, not just giving a gift As we responded in faith to the opportunities and open doors God provided, he helped us, over time, to learn to be a serving gift from God to the community — with no strings attached—not even membership growth! We’ve had many opportunities. For example, we mentor in a local primary school under Kids Hope AUS and have partnered with the community in establishing a township website (http://mooroolbark.org.au) that maps services available within the community. Additional partnerships with groups such as the Lions Club, Country Women’s Association, local schools and churches, the Guides and Scouts, State Emergency Service, the Community Centre and the local Shire led to us to help organize and grow the increasingly popular annual family festival called “Celebrate Mooroolbark,” as well as an annual community tree-planting day, an annual twilight picnic and carols event in the park, and free quarterly film nights at the local Community Centre, where 200-300 people enjoy a popular family movie. There has been a mutually helpful friendship with the Disabled People’s Company — a local group of people with disabilities with whom we share an annual luncheon provided by MCF. Another interesting development has been our inaugural involvement with local churches in coordinating an annual Mayoral Breakfast on the National Day of Thanksgiving, where we honor and thank those who do so much to enhance our lives within the community. During the journey of the past seven years, it has become evident that all the strands of our congregational involvement in the community are richly intertwined. Growing, interdependent networks and partnerships have developed. Some of our members have fostered deep friendships within the community even though, like most of our congregations, we are scattered through the suburbs, well beyond the bounds of Mooroolbark. In many ways MCF has become a congregation without walls. It’s not uncommon for people from the community to attend one of our services in order to catch up with some of the members. We hear regular comments in the community that Mooroolbark would be the poorer without MCF! We’ve become more sensitively aware of God’s hand at work, weaving the congregation into the fabric of the community. Earlier this year a delegation from the local Country Women’s Association attended MCF for their annual church service and, in recent years, during the “Celebrate Mooroolbark” festival, our weekly service has been transformed into an interdenominational festival service. Financial partnerships have also emerged to help us produce Living Today in Mooroolbark. Community groups make occasional small donations to assist with production costs. The local community bank makes a substantial annual contribution. And in the last two years, a local real-estate agent has undertaken the free distribution of the magazine through his private distribution network. These helpful partnerships have enabled us to expand the quarterly circulation. There have also been unexpected benefits. Interviews with local, state and federal government representatives have led to long-term friendships, enabling some government leaders to generously offer us advice and practical help so that we’re able to serve Mooroolbark better. We’ve discovered, too, that through personal delivery of magazines to local schools, churches, clubs and people or groups featured in each issue has helped to build and strengthen local networks. As a small congregation, we’re grateful for the surprising way God has led us. And along the way, as friendships, networks and partnerships have been formed in Mooroolbark, he’s helped us learn to increasingly love and serve people the way he does.